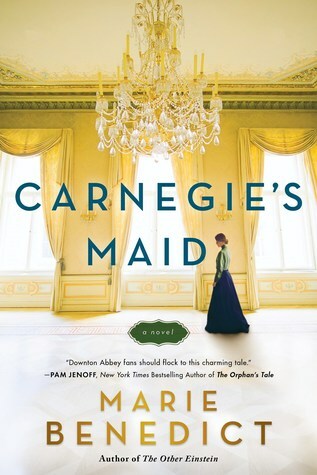 Carnegie's Maid by Marie Benedict. Sourcebooks Landmark. Ebook. 288 pages. Carnegie's Maid centers on a period of time in Clara Kelley's life, from her journey to America from Ireland through her employment as lady's maid to Mrs. Carnegie, mother of the famous Andrew Carnegie. I'll be completely honest and admit that I really didn't know much about the Carnegie family. I've of course heard the name and know the very vaguest bits of information about them, but that's about it, so I was actually rather excited to read a book that might enlighten me. This book did indeed deliver on teaching me more about the business of Andrew Carnegie, but it of course focused much more on Clara and how she managed to start an entirely new life on her own, adapt to a new course of work, and even educate herself further with the help of Mr. Carnegie. I appreciated the subtle insight into the gap between the rich, the poor, and the working class, as well as the brief bit that focused on the ongoing Civil War and the struggle for many newly-freed and escaped slaves. Clara is a highly intelligent woman, and I'm happy to say that overall I really loved her character. Not only is she intelligent in an academic manner, but she also has so much common sense. It was so refreshing to read about a character like Clara. There were so many instances in this book where Clara could have been too stubborn or outspoken or said something to get in trouble, but she knew to use her brain and avoided those moments! I would say that about ninety-two percent of the books I read feature characters who think, "I know that I shouldn't do/say something, but gosh, my feelings are just too strong to handle something that would keep me from being thrown out on the street," and thus do/say the bad thing and get thrown out. Maybe I'm being too dramatic, but let's just say that I found Clara to be a intelligent, and also very complex, character. The only frustration was that by the end of the book I felt like the author had also pounded over my head the fact that Clara is so smart, especially for her class status. I liked that the romance was so slow-building and didn't just sort of appear out of nowhere, but I almost found it to be a bit too subtle at times. Part of me really liked that, but part of me felt that this book needed more to make the actions of the characters more understandable. Something that confused me somewhat was that in the beginning of the book (and at a few other times) we are told that Mrs. Carnegie is an impossibly difficult woman to please and that no lady's maids every make it working for her (I was think Emily Gilmore-style here). But then Clara takes the job and seems to have no problems that I can discern. Mrs. Carnegie does not seem exceptionally demanding or difficult to work for, so I just feel like that part of the story wasn't done as well as it could have been. The part of this book that frustrated me twas the ending. It was one of those where you turn the page expecting a new chapter, and instead the page says 'Epilogue.' I don't mind open endings or those that leave you wanting more in a good way, but I don't like endings that leave me feeling jilted and like I wasn't fulled finished with the book. Looking back, I see why Benedict ended it where she did and the epilogue does answer some questions, but I was just left feeling like this book didn't fulfill what it was supposed to; it left me asking 'why did I just read this book?' I appreciated that there was an epilogue that helped to fill in some of the leftover gaps, but it just didn't feel quite as smooth as it could have been. Overall, I've still given Carnegie's Maid four stars. Despite the rather lackluster ending, I really enjoyed this book and reading about this period in history in America. I'm looking forward to this one, too. I like upstairs-downstairs stories, and Clara sounds like an amazing character!